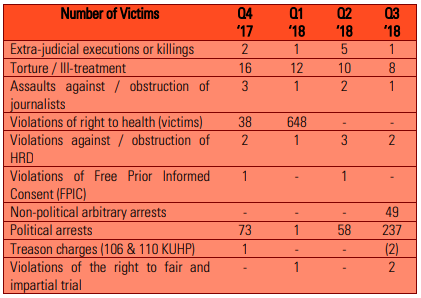 Besides these quantitative observations, this reporting period is characterized by a series of harassments against Papuan students which indicate patterns in the strategy of law enforcement institutions. The ‘Papuan Student Alliance’ (AMP) reported four such cases in the Province of East Java. The cases show a similar pattern, where police closely cooperates with nationalist mass organisations (ORMAS) and local government officials to prevent Papuan students from engaging in peaceful political activity. The strategy seems to have the purpose of intimidating the Papuan students and to make these operations appear to be legal law enforcement operations. In all four cases, police officers did not present a warrant or other document as a legal justification for police officers entering and searching the dormitory premises. The arrest of Polish citizen Jakub Skrzypski has drawn the attention of international news outlets and human rights organisations. Skryzipski could be the first foreigner to be prosecuted with charges of treason, carrying a maximum sentence of 20 years imprisonment. Sources indicate that Indonesian police used mobile phone images of him holding guns as evidence of being an arms dealer. The police claims that they found ammunition as well. Reports included in the ICP third quarter. *All dates are when reports were published to ICP. Series of arrests in Papuan central highlands – Police takes Polish citizen into custody.